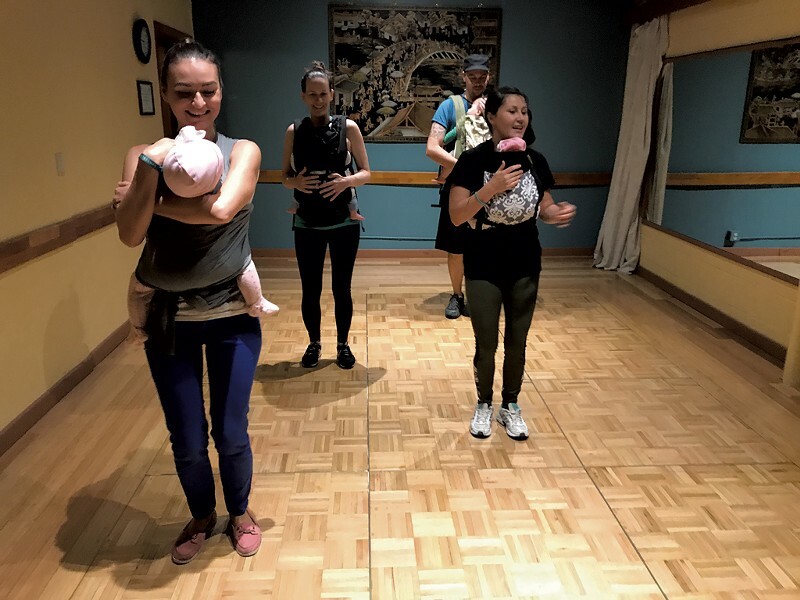 Bopping With Baby | Fit Families | Kids VT - small people, big ideas! I was so wrapped up in memorizing the routines that I forgot about the toddler strapped to my body. Before attending a GroovaRoo Vermont dance class in October, I hadn't let loose to a Ciara song since my college dance-party days. This time, rather than getting rowdy with my girlfriends, I had the pleasure of cutting a rug while wearing my 1-year-old daughter, Virginia, on my chest. GroovaRoo Dance is a babywearing dance program cofounded by California-based couple Amber and Meeshi Anjali, a babywearing educator and dance teacher, respectively. Their classes, which are taught around the globe, aim to build interactive family dance communities. 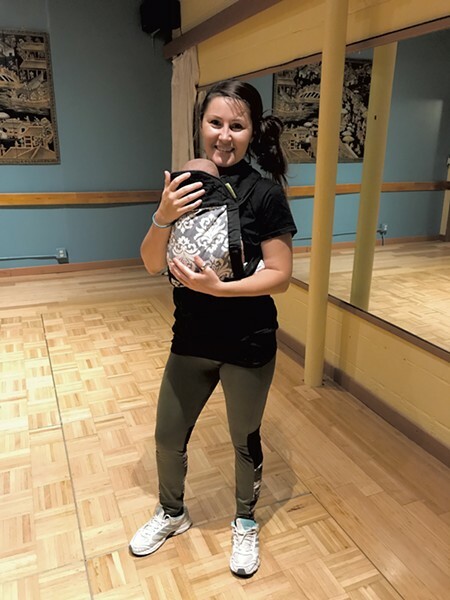 While learning choreography, parents and caregivers are encouraged to carry their kiddos on their chests, facing inward for a heart-to-heart connection, and to wrap their arms around the baby to show support and affection. Bob Marley's "One Love" set a tender tone as certified instructor Kadina Malicbegovic walked adults through some safety tips and a gentle warm-up. An artist, who owns face and body painting business Little Artsy Faces and other creative enterprises, Malicbegovic was cognizant of the fatigue that can accompany early parenthood. She highlighted the importance of hydration and made it clear that breaks were A-OK. Fellow movers included two moms with their tots and Malicbegovic's partner, Drew Leiphart, carrying their son Julian Ali. (Malicbegovic told me over email that in one of her first classes, "the first person that showed up was a dad with his son. He rocked it!"). After going over some basic steps, it was time to boogie. We learned two routines in the 75-minute lesson. The first was set to Ciara's 2004 club banger, "One, Two Step," and the second to hip-hop artist Kid Ink's "Body Language." GroovaRoo choreography is based on soul line dancing — think popular group dances such as the electric slide and the cupid shuffle. Since no previous experience is required, Malicbegovic broke down each pattern step-by-step, teaching one eight- or 16-count segment at a time until the group was dancing in unison. I was so wrapped up in memorizing the routines that I forgot about the considerable weight of a 22-pound toddler strapped to my body. Along with providing an active experience and the opportunity to meet other caregivers, GroovaRoo promotes bonding between babies and grown-ups. The close contact and rhythmic movement proved soothing during a few of Virginia's fussy moments, and she got the giggles during a move that involved kissing her on the forehead. Some babies even fell asleep while their parents got their groove on. Despite having experience on the dance floor pre-baby, I wasn't so sure I could keep up with choreographed moves. But the repetitive nature of line dance, coupled with Malicbegovic's upbeat smiles and high fives, set me at ease. By the end of class, I had found my footing in a variety of techniques including the walk and snap, cha-cha, slide, sailor step and lock step — all with Virginia nestled safely against my chest. 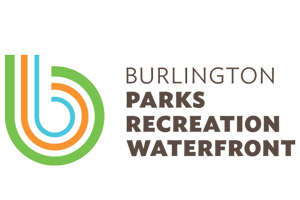 GroovaRoo Vermont dance classes will be offered for free at 10 a.m. every Friday from January 5 through February 23 at the Fletcher Free Library (235 College St., Burlington). Babes can range from 6 weeks old to toddlers, and participants should bring water and wear comfy clothes and shoes. For more information, visit littleartsyfaces.com or email Kadina Malicbegovic at littleartsyfaces@hotmail.com.